Macc Supercross is always a good event. The park is big enough for a wide, fast course and has enough elevation within it to make for some leg testing climbs and swoopy descents. Add in a good smattering of off camber sections and you’re onto a winner. The fact that it tends to be one of the final races before the National champs, so is often used by some of the top UK guys as a warm up just adds to the good course to make for a great event. I dropped the pressure in my tyres as low as I dared to give me a bit more grip on what turned out to be an amazingly slippery course. With a few (fast!) exceptions, each turn was a fantastic balancing act with speed and lean angle in constant question. Even during the pre race course exploration I was drifting around continually. Awesome fun. The race was, frankly, brilliant. Not the best start, combined with a super slow motion crash as Isaac slipped over in front of me, leaving me nowhere to go but over the top of him, gave the fast lads a lead they didn’t really need but I reminded myself that I was there to have fun, so just got on with wrestling the bike around the corners and sprinting the straights. Getting the water barrel trolley stuck in the mud while dragging them over to the pits before today’s race should have told me all I needed to know about the conditions awaiting me. Actually, no, coming within a whisker of getting the van stuck in the mud within seconds of turning off the main road onto the race site should have told me all I needed to know. This was not to be a fast, dusty race. The big chainring was to be of no use today. Socks were destined to be soggy. Probably be able to just wipe the dust off after today's race ? I still felt the need to pre ride the course and discovered, to my delight, that it was an absolute hoot to ride (those bits that were rideable, anyway). My ‘cross skillset needs lots of work and this race course had chance after chance to work on them. Slippy, slidey corners, run ups, drops and plenty of places to practice the sort of mid race decision making that can move you up the results sheet; is it faster to run / follow the line of those in front or ride that line over there / swap bikes or keep pushing on on the current bike etc. The best gift an aspiring ‘cross racer could get! Thanks to the slower nature of the conditions, I didn’t get a bad start at all. Certainly, as we passed the pits for the first time I was up amongst the fast starters, which I tried to ignore while getting on with concentrating on my lines, riding smoothly, staying clipped on and pedalling through the corners while always looking for alternative lines to keep the pace up. Oh and running properly too. Lots of that! Somewhat unluckily, on that first lap I managed to bugger up a small stream crossing – catching an unseen rock under the slop that pitched me off to the side – and landed splat in the cold, grubby water. Hoping no-one caught the incident on camera I clambered up and set about getting back on terms with the riders that had gone through while I splashed about! The tortuous nature of the mud took it’s toll on both riders and bikes, with many having mechanical issues. While chasing Rob Rowson my chain jammed itself up between the chainring and the frame, luckily a hasty bit of back pedalling got it free before any damage was done to the rest of the drivechain, but I decided to ease back slightly to nurse the bike round and swap on the next pass of the pits. Stuck record time: THANK YOU ONCE AGAIN AND EVEN MORE THAN NORMAL to everyone in the pits for me – every time I wanted a clean bike I got one (this takes A LOT of work and makes everyone involved bloody awesome in my book). Thank you to everyone cheering me on round the course, at the risk of sounding like I’ve had too much mulled wine, winter’s got nothing on the warmth amongst the NW CX community, I love that we’re all in it together and know that making the atmosphere at these races is as important as riding and finally thank you to everyone putting these races on; the hard work is totally TOTALLY worth it. Last weekend’s race was at a new venue, somewhere not far from the North Pole I think, based on the number of layers people were wearing (me included). My first race of the season, over in Yorkshire, with temperatures in the high 20s – low 30s was a really *really* distant memory by the time I dared to start taking warm-up layers off on the start line, with “feels like” temperatures of minus 6 and cold, cold rain being blown in on a strong wind turning extremities into useless stumps. The race itself went as well as I could have hoped really, I’d not felt great during the week but tried to put that to the back of my mind and just push what gears I could without getting too stressed about it. My power was down – with my average heart rate being about 15bpm off where it should have been during a race – and I lost the ability to change gear a couple of laps in when my hands stopped working (my own fault for not wearing decent gloves in those conditions, but the race course was so entertaining I still enjoyed trying to ride it smoothly, even if I couldn’t accelerate out of the corners / up the climbs like I wanted. The mix of “give it some” straights, twisty-turny sections where keeping momentum was key, long gravelly climbs to get the lungs bursting out of your chest and a few cheeky little drops to catch out the unaware made for great racing and hopefully next year I’ll be on top form for it. 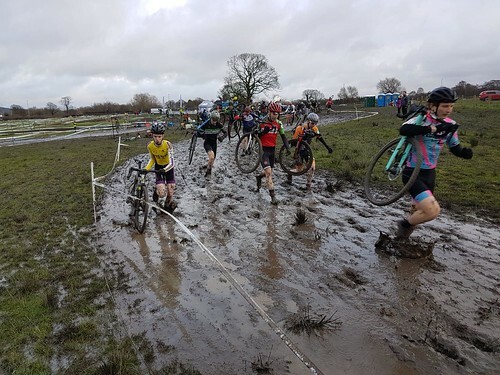 At risk of sounding like a bit of a broken record, THANK YOU to everyone from Horwich who hung out in the pits in the awful conditions to pit for me – I swapped bikes once to be safe after the mud and grass started to clog up the #1 bike and every lap the noisy support was very welcome. Thanks also to all the marshals who, basically, stood in life-endangeringly cold weather for an entire day so I could play at bicycles and to the organisers who ran a great event when many would pack up and go home to regain the feeling in their limbs! Just brilliant. Anyway, after a couple of races that haven’t gone too well I was looking to get a ride in with no stress – just race my bike without being massively interested in the result. 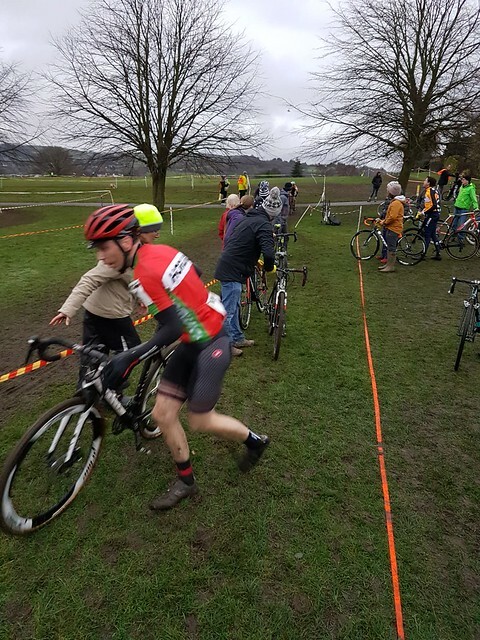 As a Yorkshire league race I wasn’t worrying about how many points I’d get – plus as it clashed with a National Trophy race it wasn’t a counting race anyway – so for me it was just a chance to rag a bicycle round a course kindly set up by someone for an hour or so. Perfect. Even better, when I arrived I found the course to be totally different to your average CX race. Making use of the local terrain the course had elements of old school XC running races (with steep unrideable run ups, bridges and the like), MTB courses (with plenty of opportunity to choose lines on the descents – off the little drop, or round it to keep a wider, smoother line etc), big splash opportunities through river crossings and some wonderfully swoopy bits of hardpack singletrack that appeared to be part of a purpose built MTB course winding it’s way down the hillside. Of course, the ubiquitous long, grassy field drag was still in there, as were the tricky off camber climbs/descents, just in case you were missing them. Great, a chance to practice skills rather than just blast round something – just what I wanted! I hung around to watch the youth races (fair play to all the kids riding those descents – great stuff!) and have a couple of goes round the course before toddling off back to the car to get set up for the race. I planned to stay on one bike if at all possible, so dropped a spare bike in the pits in the hope of not needing it, before nipping off for a little pootle round the local lanes in place of a proper warm up – any excuse to gawp at the classic 3 Peaks scenery (I noticed I wasn’t the only person doing this 😉 ). With no ranking points I didn’t bother heading over to the start early to get gridded. I wasn’t fussed where I was at the beginning of the race, in fact queuing up a couple of rows back in a little huddle of NWCCA riders was quite pleasant. Saying all that, I got a decent start and by the first real obstacle I’d made up quite a few places, managing to avoid the traffic jam over a bridge to the compulsary run up. As the race went on I worked my way up through the rankings for the most part – sliding out under the tape on one lap cost me what felt like minutes, as I battled at the side of the course to untangle myself from the tape (in reality it won’t have been more than about 20 seconds, but it doesn’t half feel like forever!). Rather than race ‘all out’ I tried to stay smooth, look for better lines round each section of the course and ride clipped in as much as possible. It seemed to work quite well and I was feeling pretty pleased with how I was riding the tricky sections after the last couple of error filled races in the mud. On what turned out to be the last lap (I’d not really been paying attention to how the race was going, focusing more on the way I was riding and keeping the bike clean enough to not need to change to the spare), I found myself racing just behind one of the fast juniors. We’d traded places a couple of times and generally been hounding each other in the turns. It’d been great fun and all part of the experience of racing cyclocross, but I felt a pang of guilt when he lightly missed his line into a muddy drop and pitched himself over the bars. Oops. I crossed the line in what turned out to be 3rd place – quite a bit back from Rob Jebb and Ian Taylor, but still on the podium. Happy days! I love Peel Park cyclocross races. It’s such a good venue, with enough elevation difference to allow organisers some ‘proper’ descents, some really tough run ups, plenty of cambers of test skill and tyre pressure and enough natural obstacles and open spaces to create a flowing, wide and still exciting route. Somehow it’s been combined with confusingly slippery mud to result in one of the best tests for the aspiring ‘crosser. It even looks good when you park up and watch the early races take place. Peel Park doesn’t like me though. Somehow I always end up doing badly there. It’s not easy for anyone – that super slippery mud somehow manages to wreck bikes and wear out pit crews & washing kit as fast as it does rear mechs (and at this point I’m going to point out how utterly heroic everyone from the Horwich pit crew were, once again. Teamwork counts for A LOT when the conditions are hard and Paul, Dave and Liz were well up for the challenge. Brilliant stuff!). Crashes are commonplace even at the pointy end of the races and all that climbing through ankle deep, will-sucking slop will test your fitness regime to the max. No-one finds it easy and TBH I’m fine with that. It’s as hard as it’s meant to be in my eyes. Somehow though, something extra seems to go wrong each time I pin a number on there. 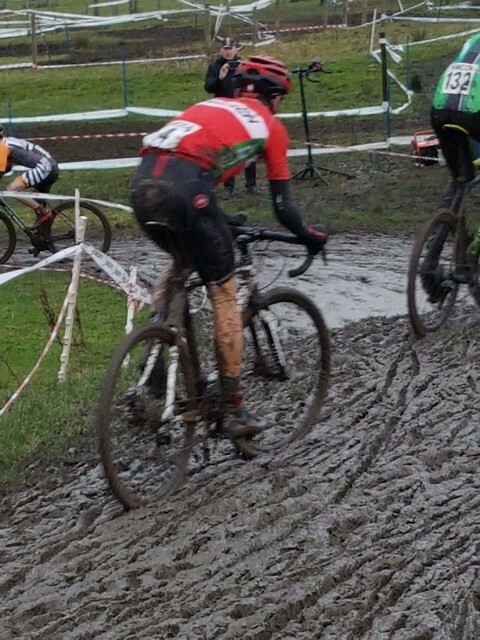 During the National championships there a couple of years ago my pedals jammed, leaving me struggling to unclip – something you do a LOT of at Peel Park, whether it be for the run ups or just to hang a steadying leg out on the slippery sections. I threw away place after place stuck at the side of the course trying to wrestle my foot out of the pedal. The National Trophy round there a year later went a similar way, with gear issues losing me any chance of a decent race. This time round I expected any performance problems to stem from a lack of sleep the night before (Happy Birthday Jacqui, BTW! Great party! 🙂 ), however despite making sure both bikes were in full working order I was hampered to the extreme by my shoes giving up on me on the first lap. I’d fitted new pedals and, although I remembered (on the start line…) to slacken the release tension on them, within seconds of the starting whistle I could tell something was very wrong. I’d been given a front row start (ace) and even managed to get clipped in straight away (hurrah! ), so should have been able to hold a decent place during the start sprint, but something was twisting around on my foot. Was the pedal loose in the crank?! Nope. Was the cleat loose in the shoe?! Didn’t seem to be. So what TF is it?! I found myself wondering as I went backwards through the pack. I discovered after the first off-the-bike- section. The entire sole of the shoe had come apart! Bits of the tread were sticking out and hanging off all over the place, to the extent that they were getting caught up in the chain and pushing it off the chainring every few pedal strokes. Off the bike, I was essentially trying to run through the mud on a super slick soled road shoe (the tread just dangling about uselessly off to the side). Race, pretty much, over. Rather than DNF I just walked/jogged/did anything I could to get round as the shoe fell apart more and more. Despite the races taking place in winter it’s very rare that you ever get cold while taking part, such is the usual intensity, but this time I did. Trotting about the place with one legs sliding out randomly wasn’t hard enough to keep me warm (and the wafts of hot vimto from the NWCCA Pom Pom Team were hellishly tempting). I finished many, many laps down, feeling pretty dejected. Not sulky, because of course sulking about bicycle racing in the park would be pretty pathetic, but a tad miserable.